Calling all moms! You do so much for others – we want to do something for you! 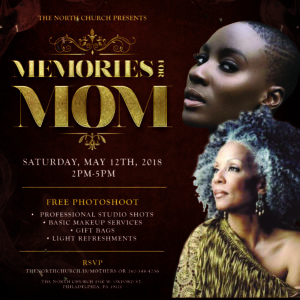 On Saturday, May 12, the North Church is hosting a FREE photo shoot for moms. That’s right – a professional photoshoot for you, with no cost to you. As if that wasn’t enough, we’re also providing a FREE makeup session so that you can look fabulous for your shoot, AND we’re giving away gift bags! Come on out and take some time to pamper yourself. You DESERVE it!!! The fun takes place from 2 to 5 pm on Saturday, May 12, at the North Church – 1510 W Oxford Street, Philadelphia. As mentioned, this is a free service that we’re providing to our community – you just need to schedule the time slot for your photo shoot. You can do that right now using the sign-up form below, or you can call 267-348-4236. Slots will be filled on a first-come, first-served basis, so sign up today! You may be thinking, “There’s gotta be a catch; who gives away stuff for free?” We assure you – there’s no catch! We just want to do something fun for the moms in our community. So come on – sign up today – and we’ll see you on Saturday, May 12.